The following product isn\'t currently available in our store: "'+decodeURIComponent(retvals)+'"
Click here to watch a video of these cells starting a dragster! Ultimate kit for your Traxxas M41 Widebody Catamaran boat! Add optional Power Supply to make it a RTR Kit. Most versatile charger on the market today! Ultimate charger for those who want to save time by charging two packs at once. This charger is incredibly versatile and has 9 available modes! This charger is capable of balance charging two Lipo packs at once with no additional accessories to purchase. In this case, you can charge 2 separate but similar Lipo or LiFePO4/A123 packs as a single unit in "SYNC" mode to make packs up to 14S at 1000W max charge power or you can charge two completely different packs in "SOLO" mode on each port at the same time. This charger is carefully designed with many built-in safety features such as reverse polarity protection, input voltage error warning, and cell count mismatch warnings for lithium chemistry batteries. Note: This charger requires a 12-24V DC power source with at least a 40A output. Order one from the drop-down menu on this product and save. 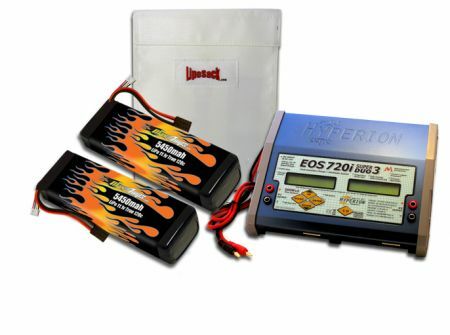 Fire resistant Lipo Sack 9" X 12"
Use this fire resistant product while charging, storing or transporting a lipo battery pack. The use of a Lipo Sack does not guarantee protection of surrounding surfaces. It is simply intended to mitigate the effects of a battery failure during charging or after a crash. MaxAmps takes no responsibility for effectiveness of the Lipo Sack. Never charge unattended. Always keep your lipo packs in a fireproof container in addition to the Lipo Sack. Avoid damage to the Lipo Sack. Replace if it becomes ripped, worn or is involved in a battery failure. If your Lipo Sack is involved in a failure resulting in a venting of the battery and fire return it to us with a statement of the circumstances and receive a replacement Lipo Sack free of charge! Lipo Sack Plus 13" x 18"
Maxamps can't be be beaten, quality or customer service!!!! I had purchased a total of 3 batteries. By far the best I've used. I would definitely recommend them to everyone looking for Max Power and run time.